My summer has been marked by spikes of joy; three in all. 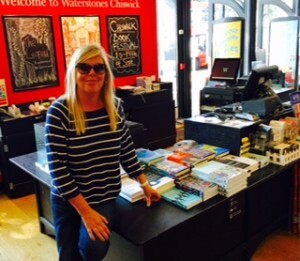 That’s the three times I saw my book in Chiswick Waterstones, on display, in three different locations. 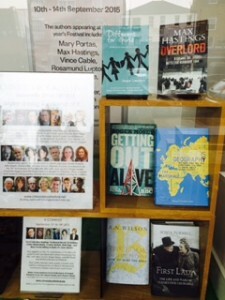 First, it was in a window display, next to Max Hastings, well not him in person, but next to his tome: ‘The Secret War: Spies, Codes and Guerrillas, 1939–1945’, which I really want to read. I wonder if Max knew he would be sat next to a book by, and about, lipstick lesbians. Of course, I had to take a photograph or two to post, tweet and email around the world. 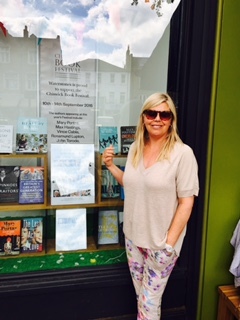 I had to have pictorial evidence that the book I’d fantasised about writing for years, not only existed but was in a flipping bookshop window. And it still is. The next spike of joy came a week later when I casually walked into Waterstones to buy my nephew a congratulatory book voucher (not many kids even sit let alone pass GCSE Latin at a north east comprehensive these days) and there it was. A pyramid of my books. This time they were cosying up to broadcaster Tim Marshall’s ‘Prisoners of Geography’, a book which explains how a country’s geography can affect their internal fortunes and international strategy. Interesting terrain and a complete juxtaposition to the content of my book but then again, that is the beauty of books. They take you from one territory to another, usually somewhere completely different. (of course, I had to take another photo to send around the world). The final spike of joy occurred last week when I went to buy a couple of readers for my daughters’ new school year. There it was again. This time it was in pride of place, positioned by the till, next to my publisher, Martin’s, dystopia novel 1909 (buy it, it’s freshly unique). I observed the person in front of me pick up my book, read the blurb and then buy it. Jeez, if only I’d been secretly filming. In the event, I had to make do with another photograph. Still beaming, I popped back a few days later to see if they’d moved it again. They hadn’t, but I was overjoyed to see that there was now only one book left from the original pyramid! Maybe they had more out back, but I just had to take a photo of the lonesome book. Tomorrow (Saturday 12th September) the stock will be replenished by my long suffering publisher, who has taken on the persona of a 1950’s book salesman, with the amount of books that he’s had to shlep around west London with. 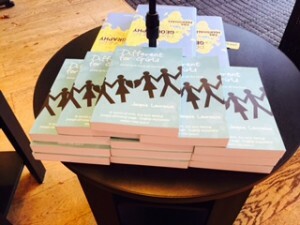 This time, though, Different for Girls will be on display throughout the 2015 Chiswick Book Festival, where I will be chairing a session with Tasmina Perry, John Bond and Nick Lloyd about marketing and promoting self-published books. Hope to see you there!